Because I have so much to do in the garden today, I thought I would start out by taking pictures of the garden - where so much needs to be done and should have been done weeks ago - and posting them on my blog. That makes perfect sense doesn't it? I knew you'd understand, gentle reader, because you have your ways, too. Ways of stalling. Ways of slowing down. Ways of taking just a minute before you head out to the garden and become drenched with sweat and covered with mud and dirt. 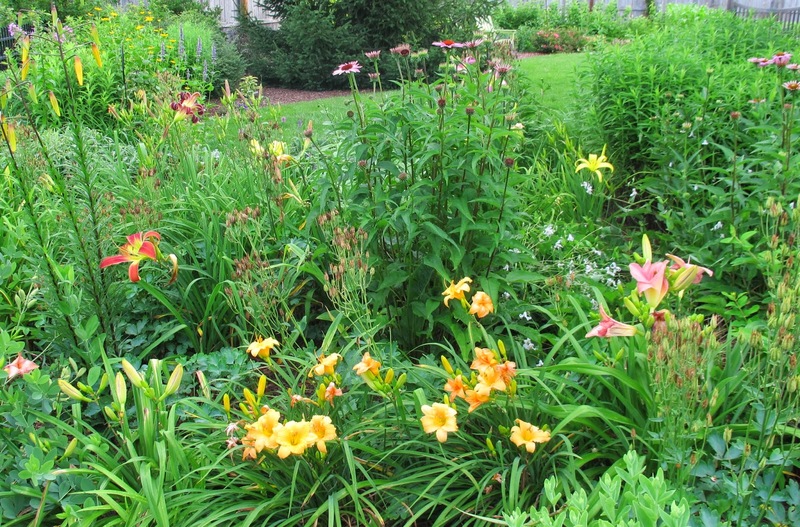 The daylilies are blooming in Plopper's Field now, along with some other warm colored flowers. I remember in the spring I thought this garden needed more colors besides blue and white. I barely recall now how blue and white it was, but it isn't blue and white now so I guess the oft spoken adage is true, "wait a minute and it will change". Or whatever that adage is. 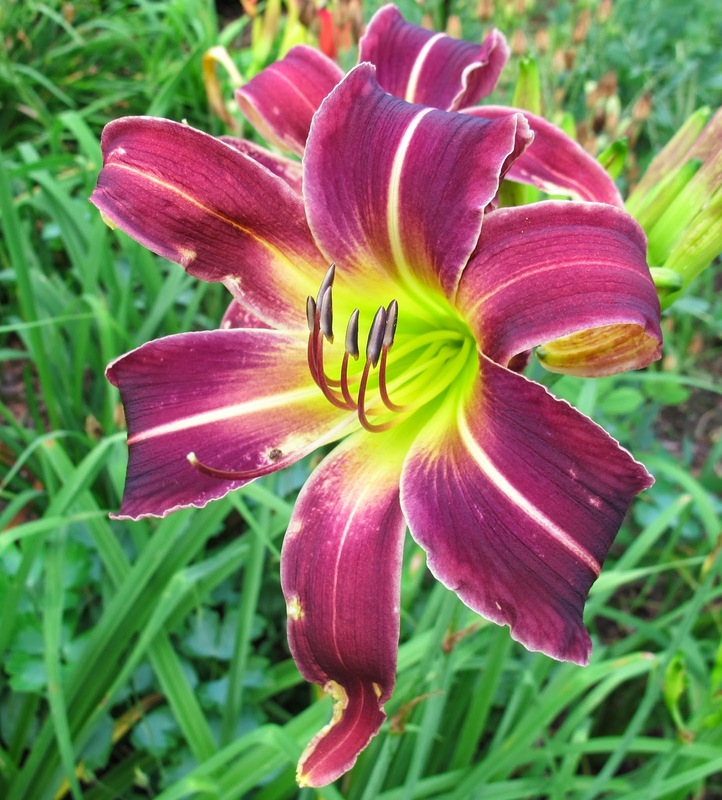 I don't live far from a daylily nursery. I can go over there just about any time to see what is in bloom and then pick what I like to buy for my own garden. 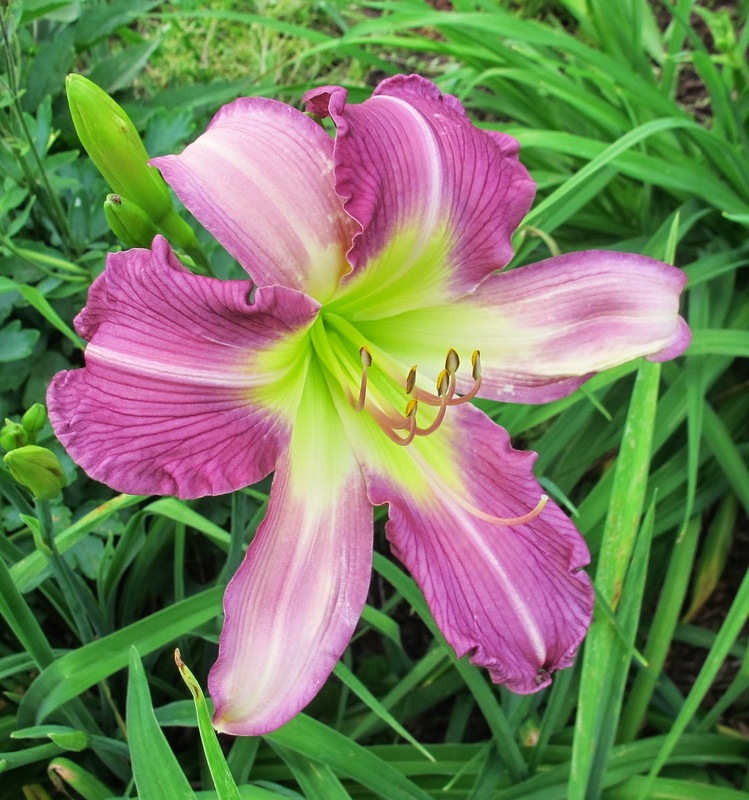 I tend to like the spider or unusual forms of daylilies, as it turns out. As if the blooming daylilies aren't enough of a reminder of how this growing season is moving right along, we have the coneflowers chiming in. The scream out "summertime summertime". 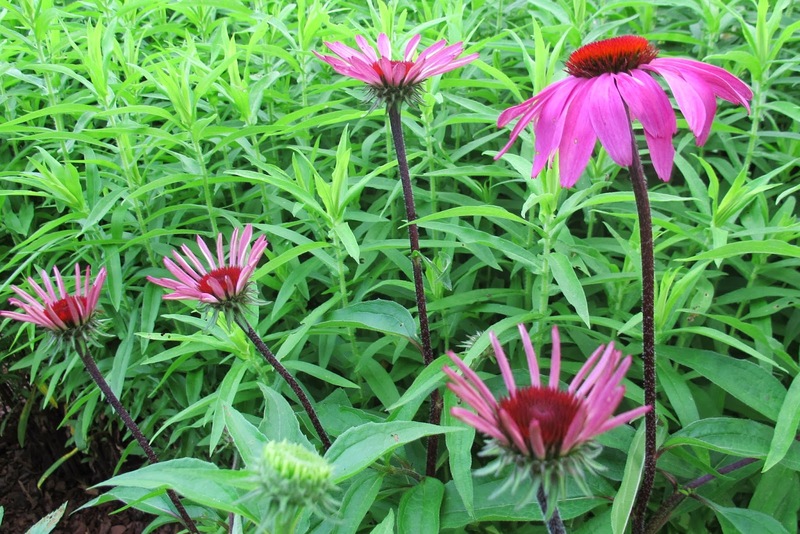 By the way, I despise those double forms of coneflowers in all those weird colors. I won't have them in my garden. Will not. Along down the way, the chairs call out. "Sit a minute. Enjoy the morning. 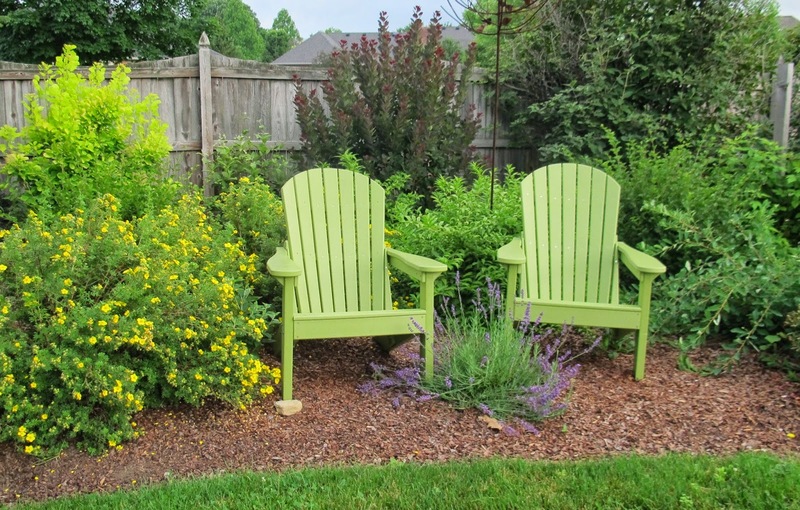 Come here and relax and ponder your latest obsession of trying to figure out a better word than "deadheading" to describe the act of removing spent blooms". So far, I've come up with reviving, fading and vereyifying, which is a tip of the shears to Rosemary Verey, a British gardener/author who insisted her gardeners should start each day by deadheading spent blooms. Yep, still mulling it over. Still looking for a better word than deadheading. Just when I thought it perhaps really was a good idea to sit for a moment, I glanced over to the nearby rose shrubs. They are looking a bit ragged after their first rush of bloom. And what is that? 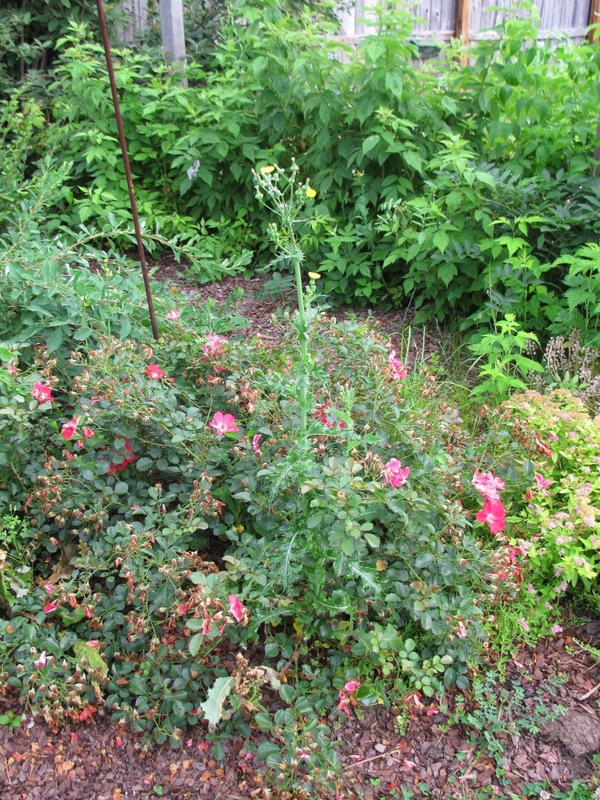 Coming right up through the rose shrub is a big old thistle. How did I miss that yesterday when I was weeding and fading flowers, or weeding and reviving flowers, or weeding and vereyfying flowers, or whatever I was doing? This is clearly an adapted sub-species of thistle which thinks it can hide in roses. It's a double-thorny weeding situation for sure to get its prickly stem out from the rose without the gardener emerging looking like her arm was used as a scratching post by a bunch of alley cats. I am up for the challenge, however, and now will positively head out to the garden, leaving you, gentle reader, with a better picture of the garden to end this post with because I don't want the image of thistle growing up through spent roses to be what you remember here. Look it's Plopper's Field, where I plop flowers in wherever there is an open spot. Let that be the image you remember of my garden today! Wear gloves to pull that thistle! Your post on weeding earlier this week had me motivated for the weekend. I'm doing a project of taking panoramic pictures of the garden about every two weeks. So I needed to do some weeding before the end of June picture. I had three thistles around the garden but I didn't know what they were, but I knew they needed to come out. My pictures from today are at http://rescuegarden.blogspot.com/2014/06/june-29-panorama.html. And I finished the chores by scrubbing the grill (even broke out the oven cleaner)si it's ready for the rest of the summer - and some cheddarwurst sausages tonight. I think you may not have overlooked a thistle, but rather a wild lettuce plant. See? Doesn't that sound a lot better! I love your garden, especially Plopper's Field. I've been envious of that locale ever since I first read of it on your blog. While you cogitate about a new term for deadheading, I'm going to be trying to come up with a name for my own version of Plopper's Field that isn't simply a theft of your cleverness. Wish me luck! Instead of deadheading, how about "tidying" ??? I'm the queen of stalling, so taking photos first makes perfect sense to me. With so many lovely blooms in your garden, though, you deserve to just sit back and enjoy it all for awhile. Love the day lilies. 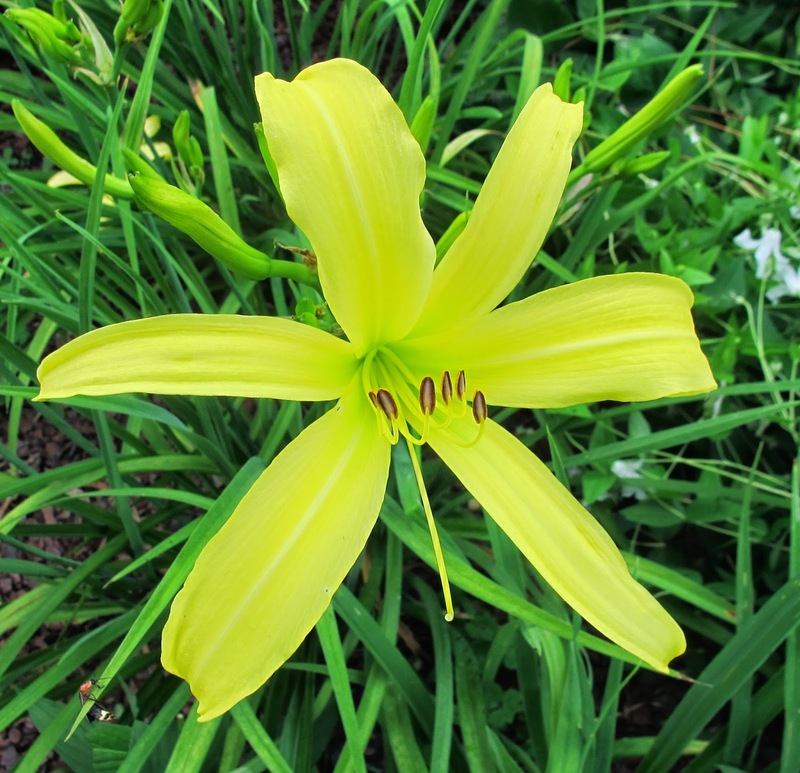 I have buds on a day lily that has not bloomed n several years. Yippee! Carol, I want to let you know that I have just finished reading Chasing The Rose. Thanks for suggesting it. What if instead of deadheading, we simply "refreshed" our flowers instead? By removing the spent flowers, we refresh them, and get them ready to bloom again. Well, it may not be funny, but it does describe what we are doing!